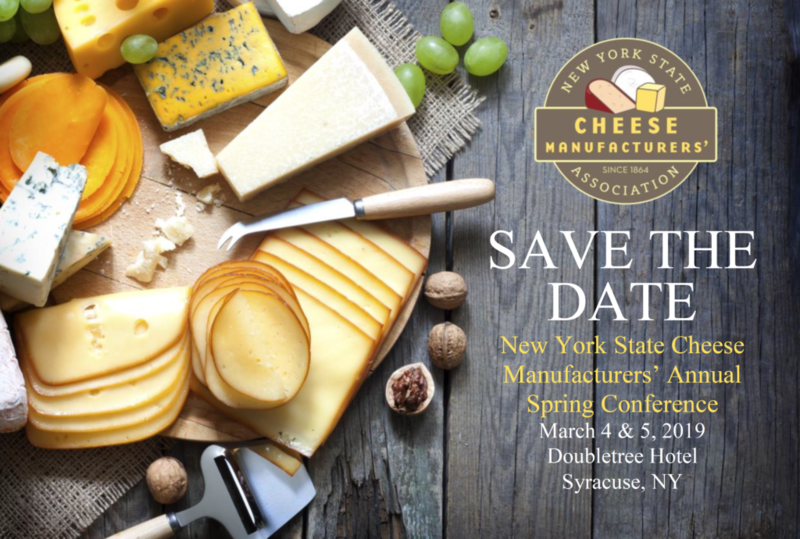 You are cordially invited to the 2019 Annual Meeting of the New York State Cheese Manufacturers’ Association to be held at the Doubletree Syracuse Hotel, Syracuse, NY on Monday and Tuesday, March 4th and 5th. We believe that all sectors of the New York State dairy industry will benefit from participating in this meeting. The NY Cheese Manufacturers’ will be hosting the meeting both days and will begin Monday morning, March 4th and end following our Awards Luncheon on Tuesday, March 5th. Panel Discussion: “New Microbiology Tests: What’s Out there and What Questions to Ask, Martin Wiedmann, Cornell University, Danielle Wellington, Neogen and company representatives from Biomerieux, and Hygiena. To help us plan, please register by Monday, February 18th. On-line registration/payment is now available by visiting our website at: https://nyscheesemakers.com/events/nys-cheese-manufacturers-2019-spring-conference/ or you can complete and return the enclosed registration form and send with your check payable to NYS CHEESE MANUFACTURERS’ BY February 18th to Janene Lucia, PO Box 348, Dryden, NY 13053. Your registration materials/ticket(s) will be available when you arrive at the conference. The registration fee is $325.00 per person for members, $425.00 for non-members and includes lunch on Monday, the cheese and wine event Monday evening, and the awards luncheon on Tuesday. We hope you or your firm will wish to co-host the Monday evening cocktail party and reception. You may sign up to co-host online, or you may use the enclosed registration form – the cost is $75.00. A sign listing the co-hosts will be displayed at the entrance to the reception room. If your company chooses to co-host, please sign-up on-line, or use the enclosed registration form. Again, we plan to provide space for exhibitors. The exhibit tables are 6 feet long and are $100 for members and $200 for non-members. Note that the registration fee to exhibit is for one participant. If additional participants per company will be attending, contact Janene (jgg3@cornell.edu) for more details/registration rate. Exhibit space will be available starting Monday, March 4th at 8:00am and continue through Tuesday afternoon March 5th. If you have any questions, contact Janene Lucia at jgg3@cornell.edu. Room reservations should be made directly with the Doubletree Hotel. To make your hotel reservation, follow this link: Doubletree Hotel Room Reservations or call the Doubletree Hotel directly at: 315-432-0200. (IMPORTANT: If phoning the Doubletree to make your reservation – you must indicate that you are with the NYS Cheese Mfrs. Association Group.) Note the hotel cut-off date is Fri., February 8th and the hotel is usually full. I suggest you make your reservation now, even if you have to cancel later. If you have any questions about the meeting, please contact Janene Lucia, e-mail: jgg3@cornell.edu, or call 607-227-5833. 10:00am – New Microbiology Tests – Panel Cont’d. **Please note that the Exhibitor Registration Fee is for 1 participant. For additional participants exhibiting/company – contact Janene Lucia for more information/fees. *** You must be registered for the conference to order additional meal tickets. A 2-minute drive from Interstate 90, this hotel on an office park is 11 minutes' drive from Syracuse Airport. Flat-screen TVs and WiFi (fee) are offered in each room, as well as traditional decor and custom-designed beds. Suites add separate living areas and 6-person dining tables. There's a nautical-themed restaurant serving American favorites, plus a lounge bar. There are also indoor and outdoor pools, and a 24/7 fitness center. Other amenities include a free airport shuttle, 12,000 sq ft of event space including 2 ballrooms, and a business center.